You are currently browsing Tristian’s articles. The HypeMachine website have gathered info from a bunch of blogs and collated all those details to come up with this: Their 50 most loved albums of 2010. Have a look and see if you’ve missed anything from this year’s best. I know my download queue just got a whole lot longer! In other news I got a whole heap of new albums when I went to Falls Festival. Lots of good artists like Big Scary, The Middle East, Cloud Control, The Morning Benders and Boy & Bear. So expect some reviews of those in the near future. So I was lying there in Barcelona with my single connection to the outside world shuffling it’s way though new songs, filling the space of the hotel room. That’s when each of the songs on this album, slowly, individually unfolded from the unknown. There was no intent; no effort made to listen to this album in particular, but for whatever reason each song from it demanded my attention and made itself known. With echoes of Evermore and whispers of the “The Hush Sound” this album has a lot going for it, and if you enjoy either you’ll feel perfectly at home here. Powering Arm’s Way are frenetic, crunchy, punk-like rhythms. With a crushing, marching beat the songs reach down into your gut and stir your militant side, but not before a lush harmony can come to offer a soothing counterpoint to the violence preceding it. It’s this dichotomy that really stands out and defines this album. It’s simply done so well. Arm’s Way has an insatiable appetite for different sounds, with a particular phrase never hanging around for long before being discarded and replaced with a fresh one. Though at some points it may feel like you’re holding on for dear life it’s never a rocky ride. This album transitions between styles with degree of skill and artistry that’s pure bliss to listen to. Driving the sound forwards is the workhorse of this album, the guitar. From the punchy, syncopated marching sections to the more relaxed arpeggios, they provide they basis of the split personalities that each of these songs posses. Always attacking in short bursts, tripping over themselves to try out their next discovery, they give this album a constant sense of urgency. The vocals on this album are wonderfully measured. Being led along by the sweep of the song, they give the feeling of someone reporting the details of an event as it occurs. Someone absolutely involved in the proceedings… The vocal styles cover a gamut of emotions, grounding you before drawing you into the changing states of the song. The vocals range from the hauntingly melodic to the desperately pleading with pretty much everything in-between. Islands have managed to take a standard rock setup, added a few violins and with some inspired layering created something that’s really unique. Well worth a listen. “Would you be open to a night of total Chaos?”, asks Dappled Cities. This album holds you close, then closer until it’s smothering you with wave after wave of electric fussed desire. It screams at your senses: a jet engine thundering by, delivering a cluster bomb of staccato electric indie rock fragments. The album is relentless in it’s ability to get within your comfort zone, then push you back out to a distance. It has no middle ground. It’s ever toppling forwards; just catching itself from falling before moving headlong into the next phase. If I was to play the mix and match game I’d call it a fusion of Midnight Juggernauts, the Gorillaz, Wagner and 80’s post punk. The album is driven by an diverse beat filled with whirs, swooshes, bumps and the occasional drum. It’s like a kid rummaging around in a futuristic box of toys. At the next level a crunchy 80’s synth sweeps and dives throughout the songs, with Dappled Cities showing of their abilities to subvert the instrument into delivering a parading rhythm and effervescent harmony. The harmony, like a hot air current holding a glider aloft, encompasses and supports the melody with the odd guest appearance of a punchy post-punk guitar backing it all up. The voice relentlessly moves forwards; leaving everything else to play catchup. Reverberating through a space of it’s own making, the understated vocals lead us through a world of jaded memories and jagged dreams. This album… We’ll it’s actually quite hard to get into. All the dissonance and odd structures make this an album you can’t connect with easily. It took me quite a few listens before I was able to unravel the signal from the noise, but you know what; often that’s a good thing. If I connect with an album straight away usually it’s because I’ve listened to many similar things before. Then soon enough that familiarity makes it just sound repetitive and dull. But not this album. You’ve never heard the likes of this album before. All that said it’s not a perfect listen through. For all the hits there are a number of misses which you’re probably going to want to skip past. With the album becoming weaker towards the end. But add it all up and on that total line you’re going to find the words ‘Great Album’. Yes, you’re going to need some patience to discover its depths. It’s seriously worth it though. Evil Urges is a damn good album which manages to ruin itself with a horrible start. After a couple of listens to it I had pretty much delegated it to the bin as I was simply unable to get past the third song. Fortunately, when I’m working I often put all my new albums on shuffle, and quite a few times I would find my self really getting into a song, switching over to iTunes to check out what it was, and seeing it was from this album. Even then it took quite a while for it to click that these same songs I was enjoying, and that crappy album I couldn’t get into were actually the same thing. So I’ll start with the bad. The first and third song are like a dentist drilling in search of my mouth’s most painful spot. Someone must have lost a serious dare, because there’s just no call for the atrocities the singer is inflicting upon us with his horrible falsetto “Prince”-like attempt at singing. My suggestion: If you do get this album delete the songs “Evil Urges” and “Highly Suspicious” and save yourself a lot pain. Whew. Now onto the good stuff. The rest of the album is a wonderful mix of Country flavoured rock and indie power ballads. Ever since the mid naughties indie has been migrating south, producing a host of great artists like Iron and Wine, Necko Case and Band of Horses. My Morning Jacket is a continuation of that process, and at the same time mixes it up with an almost Boston like area rock vibe. Not that an overarching style is an easy thing to pin down here. Even ignoring the Princeish songs, the album still has a load of variety, coming across at times more like a collection of singles than a single work. All be it a very good collection of singles. We have songs that hammer along, slow ballads, poignant introspective ones, and songs that would fit perfectly in clichéd RomCom montages. In fact at times I find myself unconsciously trying to link these song together into an imagined film script. Their different themes perfectly capture the gamut of scenes you would find in a movie with a enough similarity between them that they could form a joint narrative. 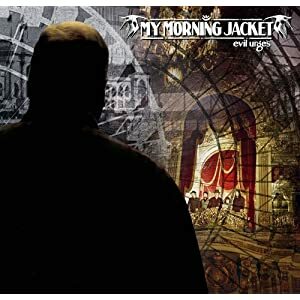 Each song takes good care of it’s listeners with My Morning Jacket showing a deft touch at gradually building a song up to a peak, then lightly letting it settle back down. The songs have been tuned with just the right amount of emphasis on each instrument’s phrasing, providing a full sound via a weaving rhythm section and a variety of strong counter melodies which fill any empty space. Given all that, it manages to feel quite natural throughout; dodging the trap of excessive production. In the end this isn’t an album I’d blithely recommend to people. There’s too much experimentation and stylist diversity for someone who isn’t really really into their indie rock. But personally, as much as I wouldn’t recommend this to a stranger I think it really is quite a neat album. 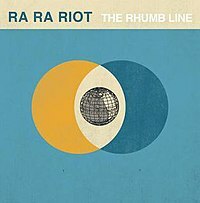 The Rhumb Line is a lush and energetic indie rock/pop album with a mournful and tragic side. Although it deals with loss and regret, it always feels breezy and optimistic. It is a cathartic and fulfilling experience, rather than one that’s moody and overcome with emotion. Ra Ra Riot is a large 6 member band with a strong strings section. Their size gives them a dense and lush sound which they use to great effect, and they have a keen jazz influence at play; reminding me in parts of Django Reinhardt. From the start this album hits with blast of energy in the form of a thumping, punching beat. Every now and then the beat lets up to give some space to an instrumental, only to come bounding back in to heighten the intensity of a passage. The album is constantly pushing, then pulling you through the songs. It masterfully changes pace and aural intensity to keep you on your toes, while not going so far that the songs lose definition and become unfocused. An artful cello brings a level of pathos that accentuates the singers yearning voice and heartfelt lyrics. Along with a violin it can regularly be heard offering a wonderful counterpoint to the vocals. Weaving at first between supporting the rhythm with the guitar and then coming out of the background to emphasise the vocal phrases with an offset harmony. The vocal style leans towards the pop side of things with a decent amount of movement and energy, though never becoming overpowering. It pulls the album forward and is the primary reason why the album retains a lighter feeling than its lyrical subject matter would suggest. The album contains a broad selection of styles, ranging from the subdued, to the non-stop. Wonderfully it manages to keep a common framework of instruments throughout all the different styles making the album strongly connected even as it changes. One-off instruments (such as a xylophone) and a changing emphasis on the core instruments keeps the album diverse the entire way through. This is an absolute joy of an album. Managing to be uplifting while leading you through a negative landscape. At Mount Zoomer like many albums I find came through Amazon’s “Customers Who Bought This Item Also Bought” feature. I don’t know what I did before it. It’s truly one of the best ways to find new music that matches up with your existing tastes. From the first track of this album you can get a good feel for how the whole thing will play out. Indie rock of course, but with a neat mix of 8-bit retro synth that was popular a couple of years ago and southern/country influence. Those may sound like a rather odd couple of styles to add. But on the whole they work well, and support rather than overpower the music. Throughout the album the band relies on strong rhythm to keep the songs in context and flowing well. This is done with some really interesting and imaginative guitar and keyboard work. The way they flow and compliment each other is wonderful to hear. The highlight of the album. But the rhythm work does have it’s darker sides. At a few points the emphasis is lost and the songs lose their focus. But more than that, the rhythm section contains too many contrasting ideas, and after a good start many of the songs seem to lose their consistency. With so much movement within single songs they start to lose their structure and unravel in the mind of the listener. Bringing me to the vocals. The vocals rarely ever rise to take a dominant role. In fact in many of the songs you’ll find the keyboards are used to prop them up. There’s nothing particularly wrong with the singers, but in the production work on this record the vocals have been pushed into the background. And it really does hurt the album. I don’t know if it’s because both Dan Boeckner & Spencer Krug are sharing the roles. But it doesn’t work. And so, for me at least, it’s a good, though fairly forgettable album. At the beginning of many of the songs I’m thinking to myself, “Oh yeah. Really love this into. Good Song”, but by the half way point I’ve already tuned out and I’m busy thinking about what I’m having for lunch. With average vocals and inconsistent song structure it’s not an album that enters my playlist very often. There are some really stylish parts, but unless you’re really struggling for new music to sink your teeth into I’d skip this one. At this stage I imagine we’ll be covering a bit of a mixture of reviews, opinion pieces, and top ten lists. But really I have no idea what direction things are going to go in. Should fun to see where this journey takes us.